President Horacio Cartes Monday vetoed the 2017 budget to avoid the risk of default after the Senate set a ceiling on the amount of debt the government could issue. 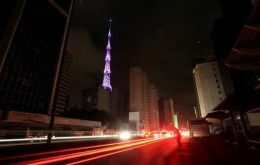 Various locations within the country, Central, Asunción and the metropolitan area have been area without power for several hours, even in places that were not hit directly by the adverse weather. 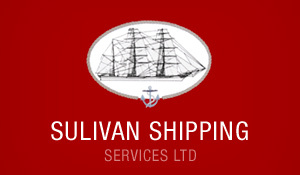 But service had to be interruped nonetheless as several destructions were reported. President Tabare Vazquez confirmed on Monday that Uruguay will continue as “coordinator” of discussions between Mercosur and the European Union to reach a wide ranging trade agreement. 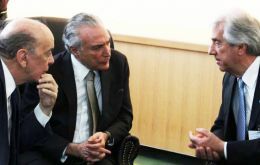 Negotiations for a trade and cooperation agreement between Mercosur and the European Union must continue and should not be overshadowed by political issues such as the impeachment process in Brazil, pointed out Paraguay's foreign minister Eladio Loizaga, following a motion by 15 Green Euro and United Left parliamentarians in Strasbourg to cancel discussions because of the corruption contaminated removal of Dilma Rousseff. Eight Paraguayan soldiers died on Saturday in a rural roadside explosion, followed by execution of survivors, 500 kilometers north of the capital Asunción, the government said, blaming it on a criminal group which identifies itself as the EPP, acronym for Paraguayan People's Army. The Brazilian government said it was deeply disappointed and surprised at statements from Uruguay's foreign minister, which are not compatible with the excelence of relations between Brazil and Uruguay, according to an official release from Itamaraty, Brazil's foreign ministry, regarding the controversy over the Mercosur presidency. Uruguay's Foreign Minister Rodolfo Nin Novoa said on Monday that he was opposed to the proposal that the Mercosur presidency should be held collectively, as a number of countries are opposed to Venezuela taking over the role. 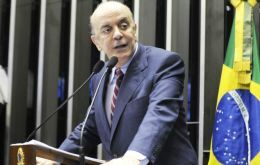 The proposal has been sponsored by Paraguay and Brazil for several weeks, particularly Brazil's Foreign Minister Jose Serra.